You must think I am crazy. You don’t hear from me in forever and then boom, two posts in a row. Well, thank my coworkers. 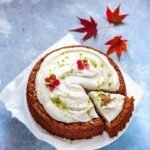 They were blown away by this carrot cake and I promised to write down the recipe for them. So, hello there, here you go! By the way, can you believe that this was the first carrot cake I have ever had in my entire life? I was always the kind of person thinking: don’t put vegetables in my sweets! But sometimes you’ve got to change your perspective. And in this case, it was so worth it! Flavoured with cinnamon and lebkuchen (gingerbread) spice this cake tastes like a giant juicy elisenlebkuchen. And those are very good! 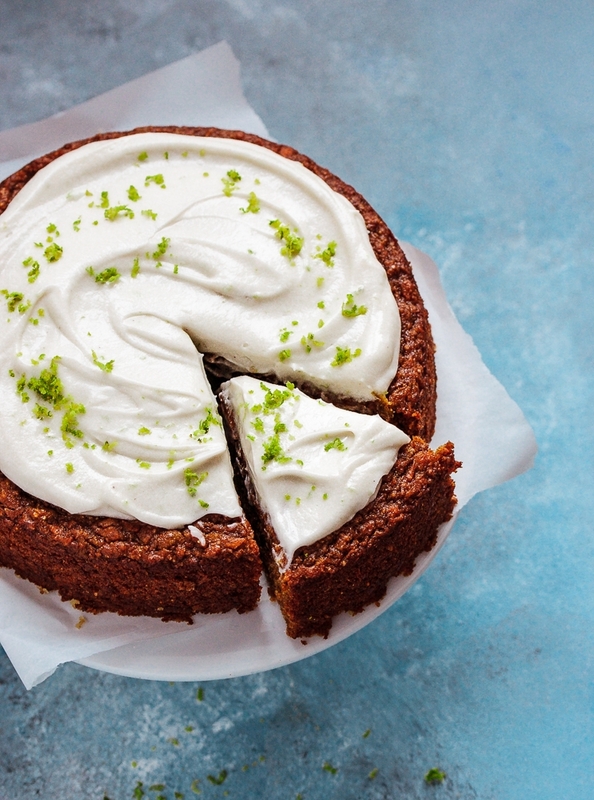 The cream cheese frosting compliments the flavour just perfectly. The recipe is adapted from a carrot cake recipe I found in a pretty new baking book called “Einfach natürlich Backen“. It’s a German baking book that has a couple of vegan recipes but call for eggs and/or butter. Which, as you all know is not a problem at all. In this recipe I simply replaced the eggs with apple sauce. I also used mostly einkorn flour instead of spelt and changed a couple of other ingredients. The einkorn flour is home ground, but since my flour mill broke, I sort of MacGyvered it and used a good old coffee grinder to make my own flour. it came out quite course, but worked out perfectly in this recipe. Since this is probably not working for you, I recommend to use whole spelt or wheat flour instead. Note: If you don’t have lebkuchen spice I have provided a recipe below. You can use user spice mixes instead, too (gingerbread, pumpkin pie). Combine all ingredients for the spice mix and store in an airtightcontainer. Preheat the oven to 180°C and grease a round cake pan (18 cm diameter). Lightly dust with flour to make cake removal easier. Add spices, flours, salt, baking powder, and zest and mix the batter until only a few lumps remain. Fold in carrots and chopped walnuts, pour batter into the pan and smooth down the surface with a palette knife. Bake for 40 minutes for a very juicy cake or for about 10 minutes longer if the cake still appears too moist. For the icing, combine cream cheese, powdered sugar and lemon zest in a bowl. Beat with a hand-held mixer until fluffy. Top your cake with the icing and serve. Ich bin wieder beeindruckt! Hoffe, dass du dir jedes Mal den Lob aller Leser zu Herzen nimmst. Woran es liegt, kann ich kaum sagen, aber die Liebe deiner Rezepte strahlt von den Bildern die Bildschirme runter. 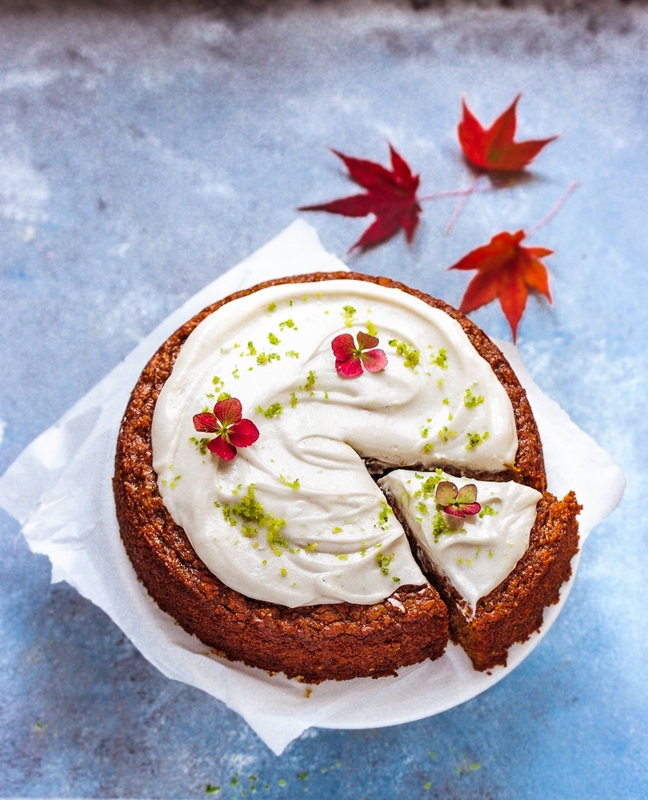 Carrot cake is one of my favourites, especially with a cream cheese icing. I love the sound of that spice mix.